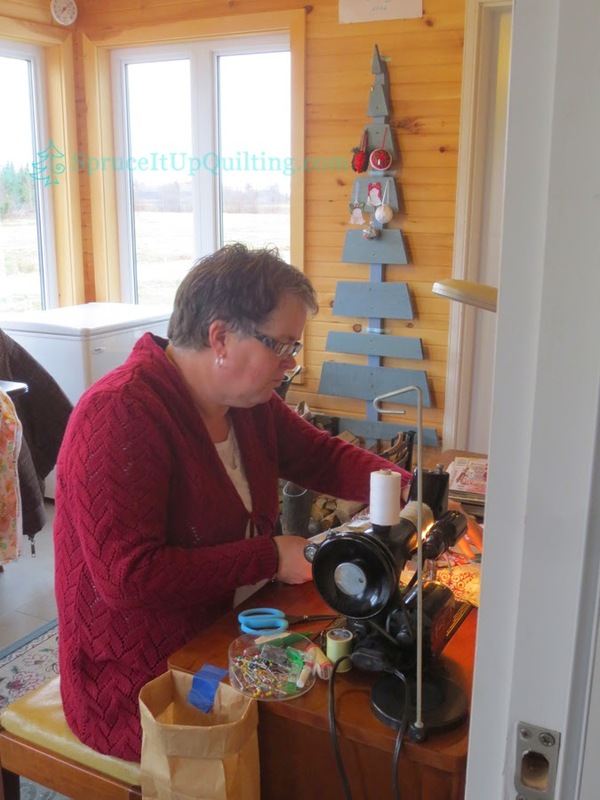 Spruce It Up Quilting: Logging with Sally! 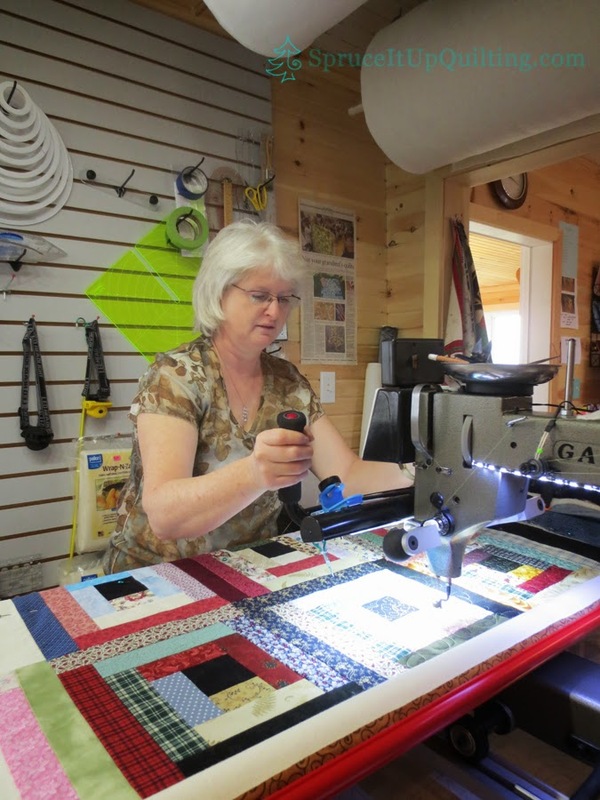 Sally was the first customer to play on Lolah in June 2014. At that time, I hadn't decided to take photos for the blog so I don't have anything to show. Files and photos (2014) saved on that dead hard drive are being recovered (I hope successfully) by our son who brought it home with him. We'll know soon if the drive was damaged beyond recovery! It looks promising after diagnostic testing so we're keeping our fingers crossed. 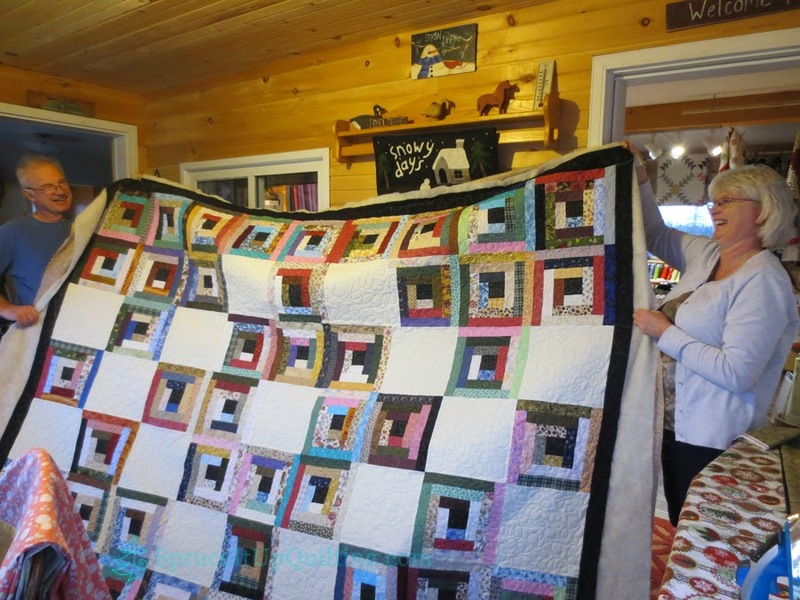 Sally returned with a colorful log cabin pieced by her friend Hollie. 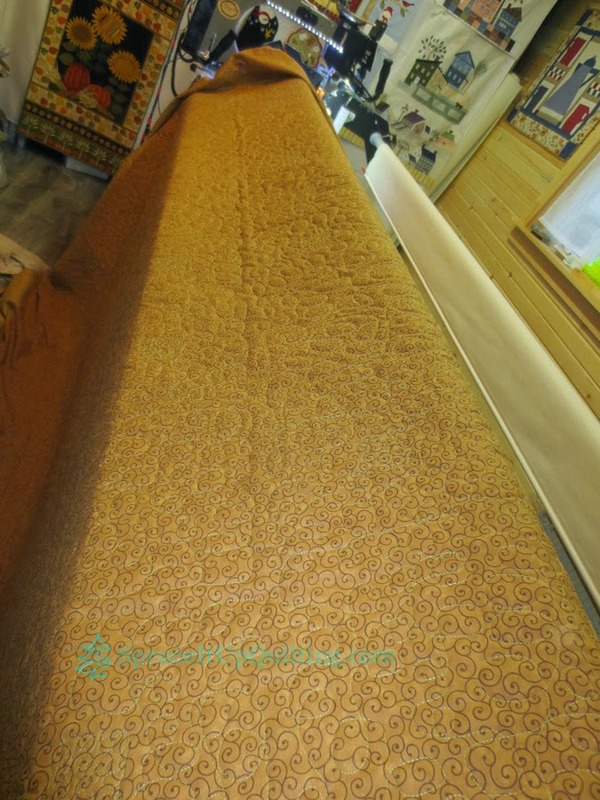 We had a long thread-choosing session which, to me, is always fun because the color you think you'd like is sometimes not the one you end up using. 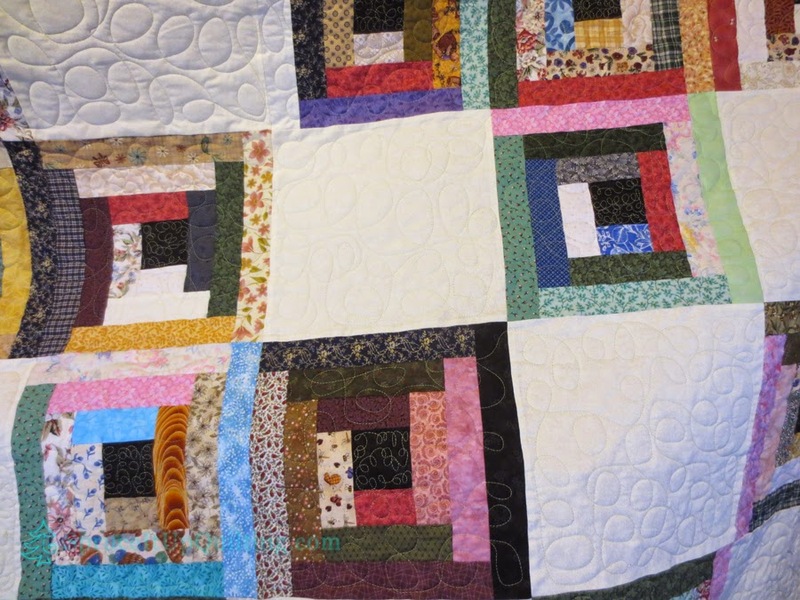 Sally chose FilTec Glide in Celery, a pale green and a wool batting. 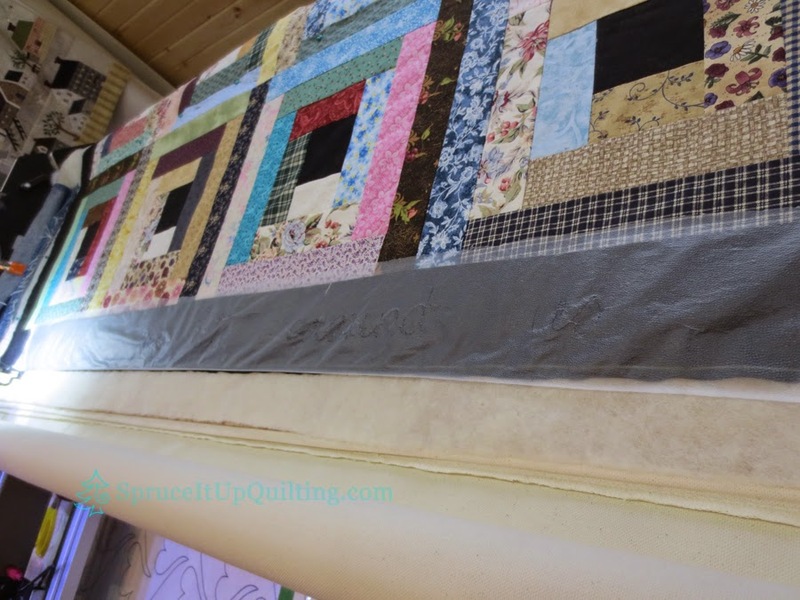 How do you quilt words on a dark fabric? 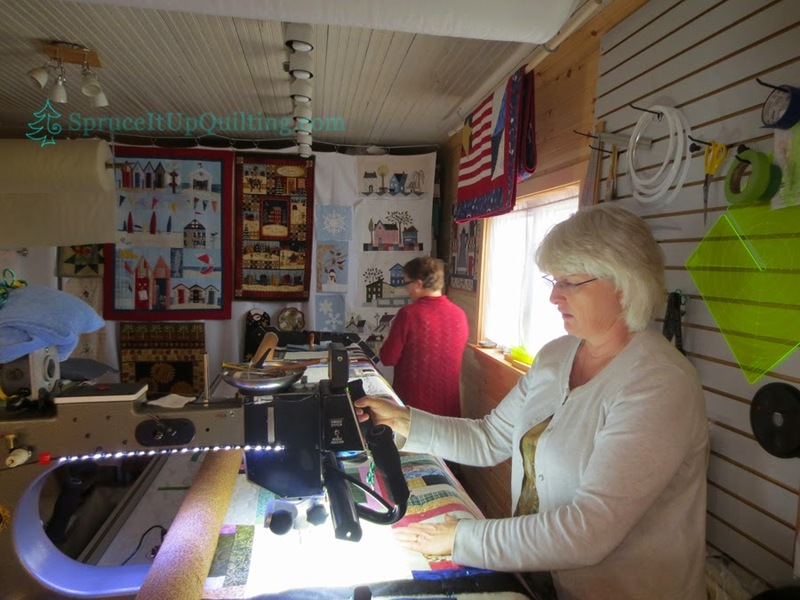 Do you freehand? Do you mark it with a white chalk pencil? 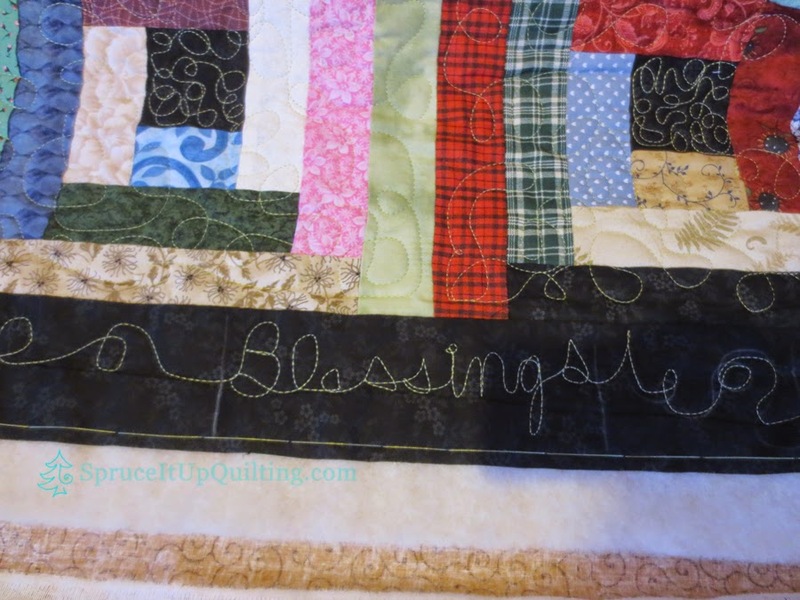 Sally wanted to write "Blessings are all around us" on all four narrow borders. In order to keep the spacing and lettering the same size, we made a template in Word, and traced the blessings on Glad Press & Seal, and "pressed" it on the border. 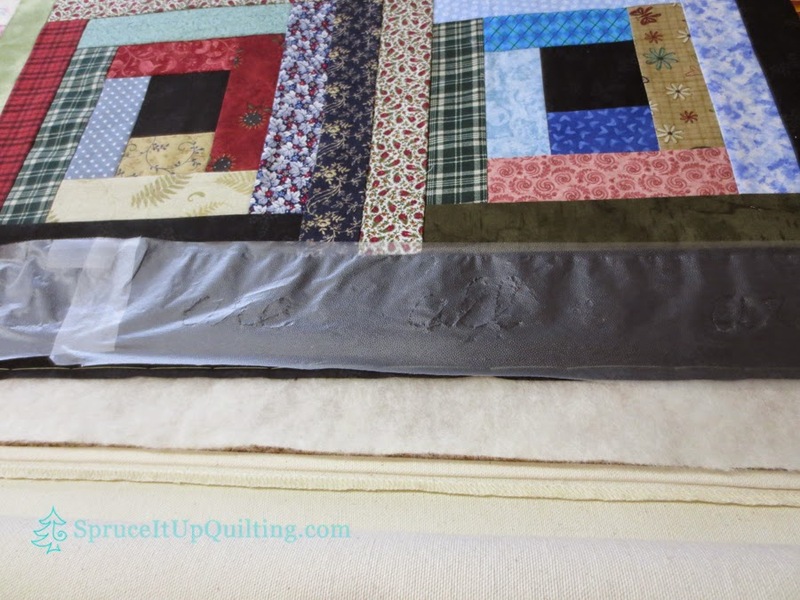 The idea is that you can quilt over the Press & Seal. It worked but it was a little difficult to see the lettering perhaps because of the reflected light off the surface. So Sally used the template mainly for spacing. The backing is quite lovely! But look at this beauty!! 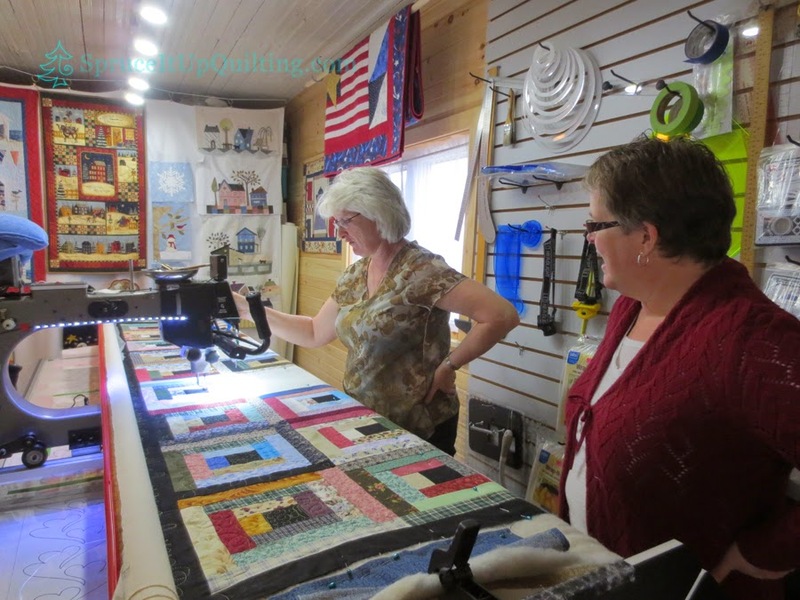 Hollie had left before Sally was done quilting so we had to enlist some help to hold up the quilt for photos! 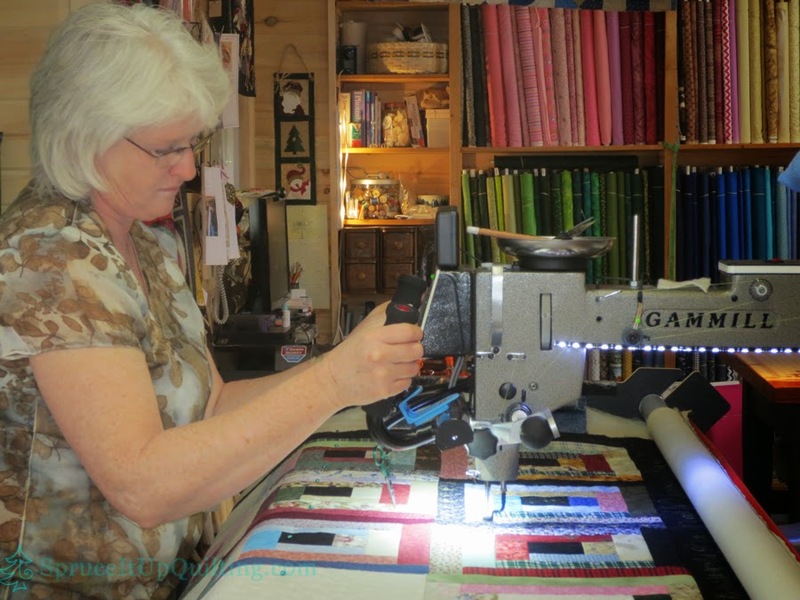 Writing adds a personalized touch to any quilt... this one is extra special to Sally! Well done Sally! This will keep your guests warm this winter! 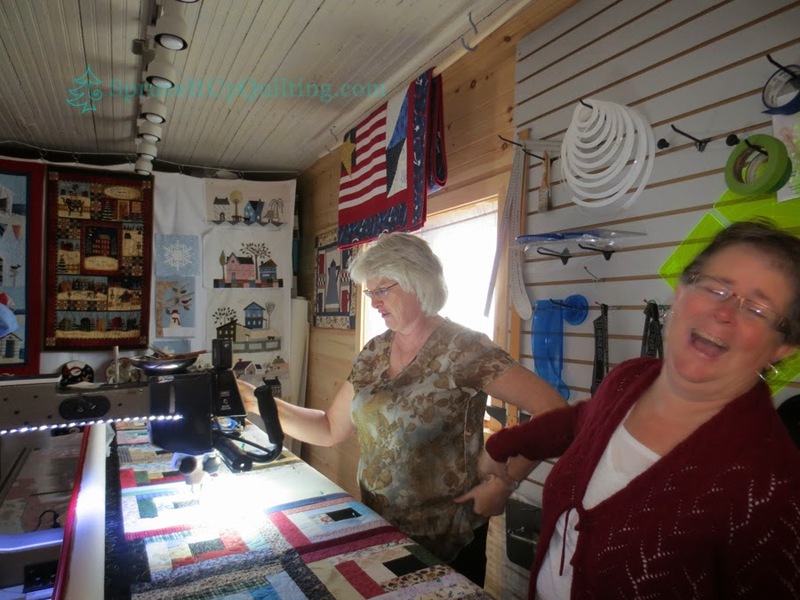 The barn progress was spotty over the holidays but we are thrilled with how it looks. The garage doors have been installed, the power has been hooked up, all the siding is applied as well as insulation, the geothermal units are in although not connected (grrrr....) but the building is secure, and we've been able to move in some boxes from the farmhouse in time for our children to arrive! The wood paneling has been delivered and will be first order to finish the walls upstairs so we can continue to empty house and trailers. Sorting, tossing, keeping, and donating will be a bear! 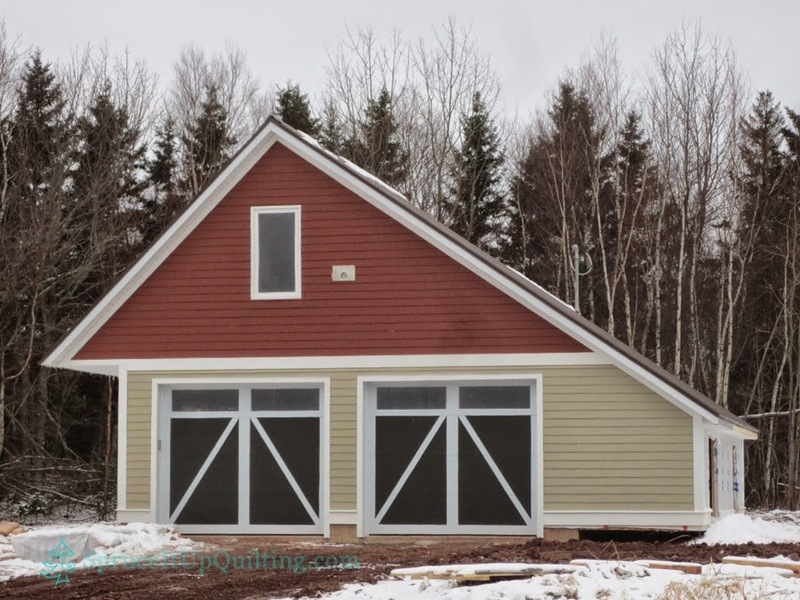 In this photo, the siding is not yet on the north wall... the two openings will get barn doors fabricated to look like the garage doors by our contractor using some siding planks. This should keep the north winds from wrenching the doors from our hands when opening them. I hope you all enjoyed a great holiday season! Happy New Year everyone! New Year! New Lolah Friend! SALE SALE SALE!